Superbly located for summer and winter holidays and recently renovated to a very high standard, the house can sleep up to 14 people. 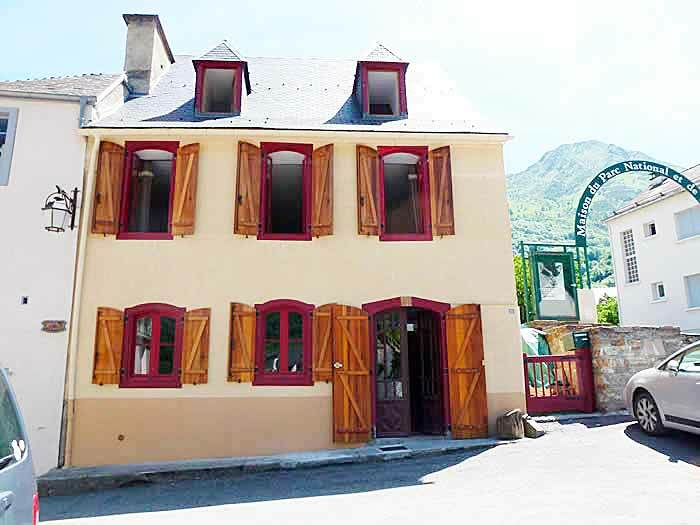 It faces onto the market square in the conservation area of old Luz and backs on to the gardens of the Maison de la Vallee, the Pyrenees National Park Centre. The town’s 12th century fortified church is 100 metres away. All the local shops, cafes and restaurants are within walking distance. There is ample parking directly in front of the house. Large lounge with wood-burning stove, three settees, satellite TV (one of the settees can be converted into a sofa bed). Large kitchen, table seating 12, double oven, ceramic /gas hob, fridge, dishwasher, under-floor heating. French windows open from the kitchen onto a courtyard (table, seating, BBQ). Utility room with washing machine, dryer, extra fridge. Bathroom with bath, shower, WC. Study with computer, wi-fi, wood-burning stove. Store area with access to exterior for skis, clothing, bikes etc. Large family room with double bed, 4 single beds in roof alcove area. Wood is provided for the stoves, electric radiators in all rooms except the lounge. Please use apartments booking form.